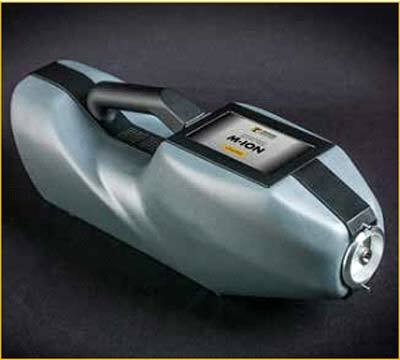 M-ION can detect and identify a wide variety of explosives including pure explosive and composite explosives under different humidity and pressure conditions in vapour and trace (particles mode). A list of explosives includes TNT, RDX, C4, Semtex, PETN, ANFO, EGDN, Nitroglycerine (NG), Dynamite, DNT, Black Powder , Ammonia and Urea nitrates, HMTD, Tetryl and mixtures thereof. The cost of M-ION’s ownership is very low, because special consumables are not required. Regular aluminum foil napkin is used for surface wiping. M-ION operates on Field Asymmetric Ion Mobility Spectrometry principle. M-ION does not contain any radiation sources. Corona discharge functions as the source of ions. M-ION has function of user authorization with the different access rights, the internal memory allows to save more than 100K results of analyzes. M-ION does not require the special calibration. M-ION is equipped with a special electrostatic valve for filtering the ions by their polarity. This valve significantly reduces false alarm rate from non-explosive materials. M-ION warms up time is less than 1 minute. M-ION is easy to use. It doesn’t require any special training. Presence of explosive in the sample is visualized on the device’s LCD display or on any Wi-Fi device that can work as a remote control. M-ION is efficient both indoors and outdoors at temperatures above zero.